Reggio is an educational philosophy that started in Reggio Emilia, Italy, after World War II. The community came together, with the help of Loris Malaguzzi, to create the most desirable education system for their youngest learners. It is not a new way of thinking. It isn’t a method. It is different from setting to setting, and community to community. Reggio is an approach to educating young children in a way that values the child as strong and capable. 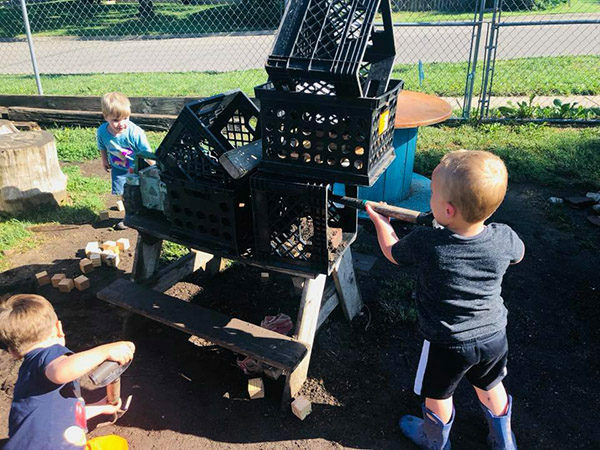 Reggio is an open-ended way of thinking that puts children first, in an environment that is rich with wonder and excitement. The curriculum embraces a child’s curiosity and interest in the world around them and uses that as the guide to what the will be learning about. Children are capable of constructing their own path of learning. We, as the adults, are there to help facilitate it. How can Reggio be used at home? Aesthetics are important. Carefully select the materials that you set out for your child to use. Rooms should be free of clutter. Natural light and natural elements of beauty are important to have. If it’s beautiful to you, it’s probably beautiful to a child. Add plants to your environment and mirrors for light and reflection. Provide children with a space where they are free to explore, using all of their senses—not limiting them to a table and chair. Go outside. Play in the rain. 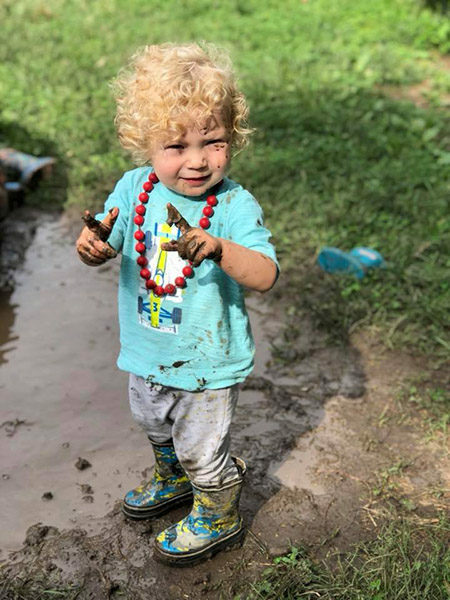 Play in the mud. Splash in the puddles. Work alongside your child, but let them take the lead. Let your child choose what they want to learn about about, and encourage them to write, paint, or build about it. Document your child’s work with photographs and quotes, capturing the process of learning. Hang this documentation to showcase their work, placing great value on what they have done. Talk to your child and listen to what they are telling you. This is an excellent time to work on language skills, while having rich conversations that show them you respect what they have to say. Singing songs, dancing, drawing, writing, painting, pretend play, and storytelling are ways children can show hands-on learning. 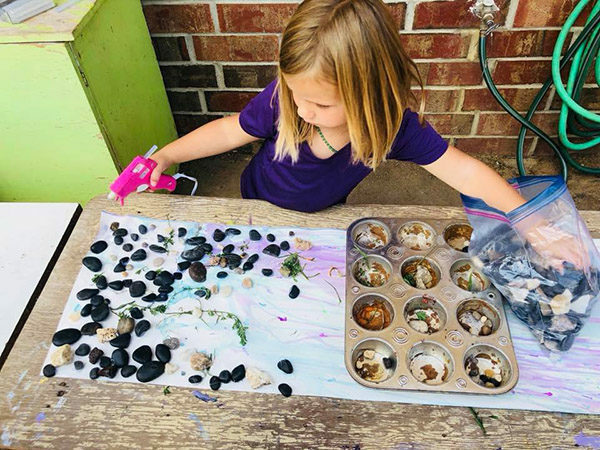 There's no need to buy expensive toys—loose parts are often found around your house and can be used for all academic areas. Acorns for counting, nuts and bolts for fine motor, leaves for making patterns, etc. Most importantly, put down the worksheets and the gold stars and let children enjoy the process and engage and create as they please. 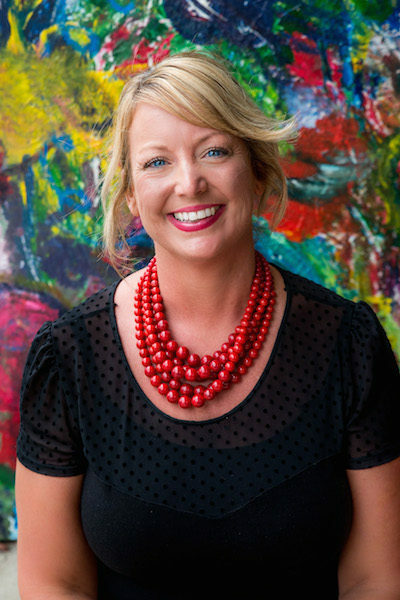 Christina Turner is the owner of Manchester School for Young Children in Topeka, Kansas. Manchester is a Reggio-inspired preschool that was established in 2012, named after Christina’s great-grandmother. Christina grew up in Topeka, earning her bachelor’s degree in early childhood education from Washburn University and a master’s degree in early childhood special education from Emporia State University. She has nineteen years experience in early childhood education. Christina was honored to be named one of Topeka’s Women Who Rock in 2013 and one of Topeka’s 20 under 40 in 2014.